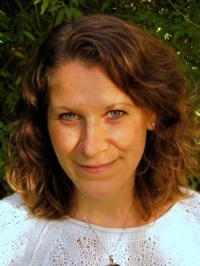 Denise Colby, Ph.D. is a certified yoga instructor and Depth Hypnosis Practitioner. She holds a doctorate degree in Chemistry from the University of California, Berkeley, and spent several years working in the biotech industry while pursuing studies and certifications in yoga, Depth Hypnosis, and energy healing. Her scientific background combines with a holistic approach to treating the mind, body, and spirit to create a patient and pragmatic approach to healing. Denise teaches yoga in several Bay Area studios, and has a private practice in Depth Hypnosis counseling and yoga therapy. Her work is rooted in a deep and compassionate understanding of the coping mechanisms and behavioral adaptations that arise from the difficult circumstances encountered in childhood and throughout life. Denise continues to pursue studies in shamanic counseling and energy healing to expand and deepen the healing she offers her clients. By addressing the body, mind, and spirit in equal measure, Denise provides a safe and understanding environment to help you rediscover the home of your heart.